Enchanted Rock State Natural Area mesmerizes with its geology, legends and natural beauty. Its rural dark sky also makes it one of the best public places for stargazing in Central Texas. The skies here are still dark enough to view the Milky Way, but they need protection from encroaching city lights. We have taken significant steps to minimize nighttime lighting in the park. Pick any place around the park to marvel at the vastness of our universe. Visit one of our Rock Star Parties to learn about the constellations and see a shooting star. 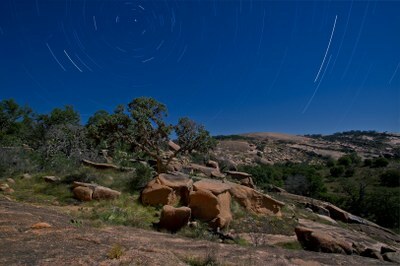 Enchanted Rock has been designated an International Dark Sky Park. Below you will see the real time sky darkness measurements at Enchanted Rock. Remember, the meter does not take readings during the day. See What is Magnitude to learn more about these measurements. To learn more, look up current moon phase information for Enchanted Rock State Natural Area or see the current moon phase calendar. The Bortle Dark-Sky Scale measures the night sky’s naked eye brightness and the stellar limiting magnitude of a particular location. In other words, it quantifies how well you can see celestial objects given the interference from light pollution and sky glow. The scale ranges from Class 1, the darkest skies available on Earth, through Class 9, inner-city skies. The map below shows the sky glow around the park with colors that match the Bortle scale. Enchanted Rock’s Bortle Scale rating is 3. Visit Bortle Scale Ratings page to see ratings for all state parks. 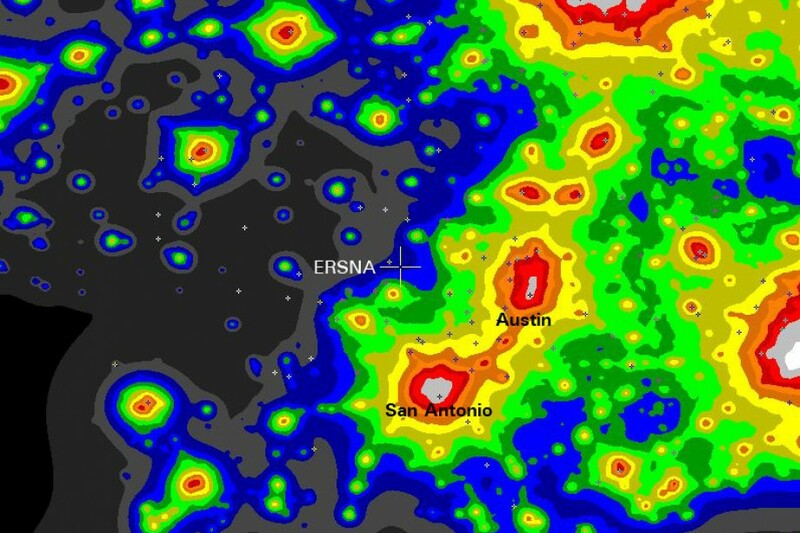 ERSNA Light Pollution Map. Enchanted Rock is designated at the ERSNA crosshairs. Both NELM and Mag/Sq Arcsec use “magnitude,” which comes from the term “apparent magnitude,” used by astronomers to describe the brightness of an object in the night sky. Apparent magnitude originally used a scale from 1 to 6, with 1 representing the magnitude of a particular reference star and 6 representing the faintest object that can be seen by the naked eye. Each level represents a change in brightness of 2.5 times. So an object of magnitude 3 is 2.5 times brighter than an object of magnitude 4. The important point to remember is that brighter objects have smaller magnitudes and fainter objects have larger magnitudes. Very bright objects have negative numbers. For example, the brightest star in the sky is Sirius with an apparent magnitude of -1.6. Sirius is near the constellation Orion in the winter sky. Some examples of objects with varying magnitudes are listed below. Naked Eye Limiting Magnitude or NELM represents the faintest magnitude that your naked eye can see in the conditions being measured. A NELM of 6.0 means you will be able to see objects as faint as magnitude 6.0; this is about as faint as the human eye can see. On the other hand, a NELM of 2.0 means the sky is relatively bright. This could be due to the moon or your location, say in an urban area with lots of light pollution. Some of the darkest locations on Earth have a NELM of around 7.0 to 7.5 - very dark, indeed. Astronomers also use Mag/Sq Arcsec to measure relative sky darkness. Mag/Sq Arcsec is the apparent magnitude for a certain square area of the sky measured in arc seconds. A square arc second is a square area of the sky that has one arc second on each side. An arc second is a very small measurement. For example, Jupiter looks very small in the sky, but through binoculars it does have a disk-like shape and a small diameter. Jupiter’s angular diameter ranges from 30 to 50 arc seconds. Therefore, Mag/Sq Arcsec means the brightness (expressed in apparent magnitude) of a one square arc second area of the sky.